Broccoli is a member of the Brassica family. Other brassicas include cauliflower, kale, Brussels sprouts, rutabagas, turnips, and radishes. The Etruscans were the first to cultivate broccoli, almost three thousand years ago. It traveled with them to the Italian peninsula, where it was a favorite vegetable. Pliny the Elder tells us that the Romans enjoyed broccoli during the first century C.E. Not surprisingly, its common name is based on the Latin Brachium meaning "strong arm or branch". Roman farmers sometimes called it "the five green fingers of Jupiter." 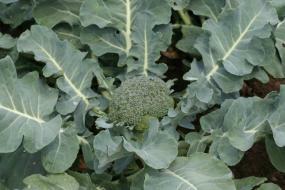 Broccoli has fleshy green flower heads on branches sprouting from a thick stalk. The branches and stalk, like the heads, are edible. The mass of florets is surrounded by leaves. Some broccoli has a purple color. Broccolis are cool-weather plants. They can be divided into two groups: over-wintering and single-season. 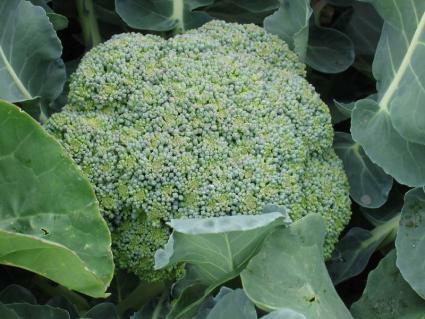 Over-wintering (or "spring") broccoli are planted in the fall and harvested in the spring where weather conditions permit or when the gardener provides enough winter protection. Don't try to plant these varieties in the spring; you'll get a very poor crop. Standard or single-season broccoli can be subdivided further into two groups. One group produces a large main head with few side shoots. The other produces a smaller main head, but after harvested, it produces many shoots which can be harvested over a long period of time. This type is sometimes called "sprouting broccoli". Remember to always rotate your crops. Planting any brassica in the same ground more often than every fourth year sharply increases the chance of clubroot infestation. Once the infestation sets in, you will be unable to grow brassicas in the area for a decade. Standard varieties should be in the garden as soon as practical in the spring so that it will be large enough to get through the heat of summer without damage. Plant growth slows at temperatures above 68 degrees F. and stops at 85 degrees, so they need to be planted early. Seedlings can tolerate a sharp frost, although they will not survive a hard freeze. Determine the latest freeze date for your area, and start seeds indoors about six weeks before that day so they will be ready to transplant into the garden. Plant the seeds in a starting medium at a depth of one-fourth to one-half an inch. Keep the seed tray warm, since broccoli germinates best at a soil temperature of 80 degrees. When the seeds have germinated, keep the air temperature around 60 degrees. Give them as much light as possible; use fluorescent tubes suspended about 2 inches above the top of the plants if necessary. Keep the developing seedlings at least an inch apart if you leave them in trays, or move each seedling to an individual two-inch pot. Provide good air circulation. Good garden soil with lots of compost dug in is ideal. A soil pH of 6.5 to 6.8 will produce the highest yields. Most brassicas take a lot of space. Place seedlings about 15 inches apart. As the plants grow and bush out, their leaves will shade out many weeds. When the plants are about half-grown, side-dress them with a high-nitrogen fertilizer. Keep them well watered, especially when the heads are developing. The green buds develop first in one large central head. Later, several small side shoots will develop. When the main head fully develops, simply cut it, with about five inches of the stem attached. The ideal moment is just before the buds start to separate and the individual florets begin to yellow slightly. Main heads are usually a minimum of four to six inches in diameter when they are ready to pick.Removing the main head stimulates the side shoots to develop. Their heads are typically smaller than the main heads, usually an inch or two in diameter. Side shoots can be harvested as long as they continue to develop, often for several weeks after the main head has been cut. Broccoli is usually steamed or boiled when served as a vegetable dish. It is also served raw with various dips. A vegetable high in soluble fiber and vitamin C, it also contains glucoraphanin, which leads to an anticancer compound sulforaphane. Clubroot infestation is the greatest problem. Don't try to save seed; the likelihood of disease is very high. Commercial brassica seed is inspected before sale.